The recent South African Asset Management Association (SAAMA) conference focused attention to the management of the asset lifecycle. Whilst this created a positive energy on the benefits of properly managing lifecycle activities, it also highlighted again that accurate and relevant asset information is a key requirement for decision making. Yet, so often this is the Achilles heel of many aspiring asset management initiatives. 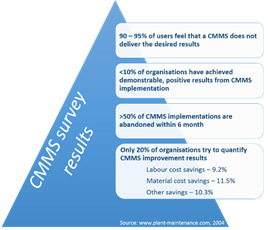 The number one reason for failure of information systems, or in this case Enterprise Asset Management System (EAMS) implementations, is known to be a lack of desired results or simply put: the EAMS or Computerised Maintenance Management System (CMMS) did not live up to expectation. In turn, the reason for this lies in the fundamentals of management software implementation which requires that the information system must always support the business process that you’re performing. Pragma has recognised this and over the last years packaged On Key with asset management business processes such as Asset Register Administration (ARA), Work Planning and Control (WPC) and Warehousing (WHS). This however, only defers the pain of recognising that you still long for more and that the real benefit is not being achieved. Sure, the variability in the business process performance has been contained, but there is little consistent and sustainable increase in the performance of the assets. The standard for asset management, ISO 55000, can assist you in hitting the sweet spot. Recently, a few tenders and industry queries have picked up on this and included in their requirements that the EAMS must be ISO 55000 compliant. This is however an erroneous statement. There are no requirements for an EAMS other than it needs to support your asset management system (AMS). 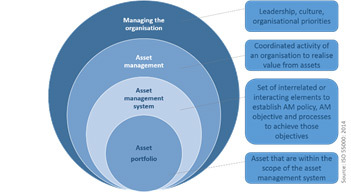 ISO 55000 defines the AMS as “a set of interrelated and interacting elements of an organisation, whose function is to establish the asset management policy and asset management objectives, and the processes, needed to achieve those objectives”. It further clarifies that “the AMS should be viewed as a set of tools, including policies, plans, business processes and information systems” and more importantly “an asset management system is more than a management information system”. The interrelated nature of information and the objectives with asset management in relation to the company objectives. Firstly, interrelated refers not only to vertical line of sight as proposed by PAS 55 but also horizontal line of sight. This means that asset management is not contained within the engineering silo and advanced integration does not only include production and financial departments, it spans the entire organisation. Is your EAMS automatically updated when a staff member resigns (HR system) or suppliers’ details change (Procurement system)? Does the marketing department have an influence on engineering objectives? The procurement, human resource and marketing departments should be equally interested in reviewing the performance of assets on their analytics dashboards. By interconnecting information systems effectively, accurate and effective data is available for analysis. The second theme as highlighted by the SAAMA Conference this year brings us to the role that an asset management system (in combination with its supporting information system) could play in an organisation’s ability to achieve its greater objectives. Up to the recent past one of the major organisational objectives were to provide monetary value to shareholders. Globally, this perception is changing. As organisations are taking a more holistic approach to stakeholder management, they are also redefining value into three categories: financial, social and environmental. The Institute of Asset Management (IAM) Chief Executive David McKeown challenged delegates attending the SAAMA conference that asset management is much less about assets than it is about creating sustainable value. The key function then of the asset information system is to supply evidence that you are delivering on your value objectives. This requires that you understand what these value statements are, that you know how to measure the performance in correlation with your value statements and the data requirements therefore.